Remember: Turn Clocks Back 1-Hour Tonight. 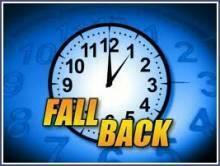 On Sunday, November 3, 2013, at 2:00 AM, clocks are turned backward 1 hour. This means sunrise and sunset will both be about 1 hour earlier. The time change should take place automatically for most with smartphones, laptops and tablets. As we change the clocks, it's a good time to put new batteries in your smoke detectors and carbon monoxide detectors. Also, check the supplies in your home emergency kit.